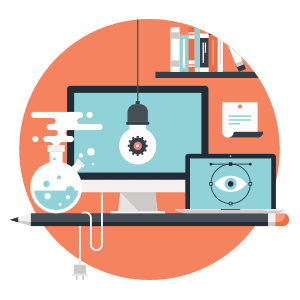 Web design, to us, is more than making something pretty. After all, pretty ...alone... is pretty lonely, so we create your site and every site with SEO, Speed, and Security in mind. We also believe in helping our clients for life and do much more for our clients than the average bear does. Working through the creative process for a web site is tough enough. You also have to consider legalities, security, SEO, SEM, future needs, hosting, psychology, demographics, and so much more. We are here to walk you through each step, even if you already have a designer or developer. Web development is the coding and implementation of software for a site to provide functionality to a website or web-based software application. 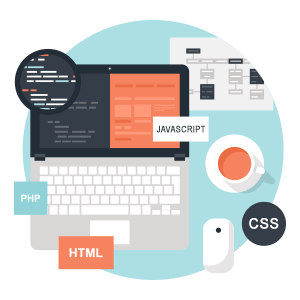 We can develop in HTML/CSS, PHP, JS, and have avenues to even more resources for more development languages, to serve any development needs. Beyond creating great websites, we help you continue the journey by bringing people to your site, and continuing to connect with them until they are a loyal customer. 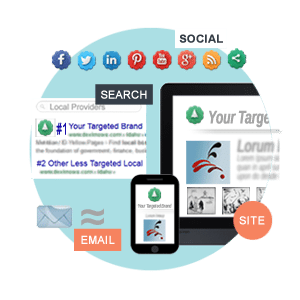 We take an "integrated" approach to web marketing, using all the different marketing channels from search to social to email to ads! What do you want others to know about your business? 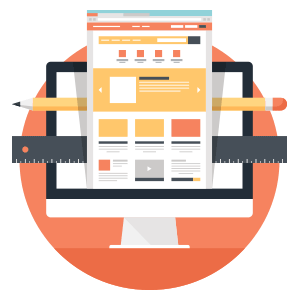 We build your site the way you want it built, with your voice, your goals, and your vision. After all, your site is yours and we work for you. We don't just make things pretty, we make them smart. Because pretty ...alone... is pretty lonely. We go beyond the call of design and are able to write code, create databases, develop new functions, create HIPAA and PCI compliant features, and so much more! We build our websites optimized from the start and make it easy for our clients, content creators, or our staff to keep content up to date with the latest keywords, information, and target the search results you are looking for. Our optimization does not stop there. We also optimize each website for speed when hosted on our server. We can optimize even further with low cost programs for those sites that are visited more. If you become blacklisted by a search engine it is not easy to get you back in the running. All it takes is some bad code and some "bad person" to take advantage and infect your site. Sometimes it is the designer using code or plugins that are untested or outdated. We develop each site with the latest and safest code, we only utilize plugins from trusted sources, and we implement even more security for the sites we build, host or maintain. We include a suite of programming tricks, and also use a WAF (Web Application Firewall) from CloudFlare or Sucuri to protect your website from "wrong doers." Whether you've got to show well in search results for your industry, or gather your raving fans on social media, or build loyalty on email marketing, we help you plan for good web marketing right from the start. We take an "integrated" approach to web marketing, meaning we look at all the different marketing channels on the web together, including your website, search engine marketing, social media, and email marketing. We focus on fitting your unique business and communication style with tools for an online campaign that’s right for you. Because we are here to help you achieve YOUR goals. We have a belief that computers and technology are cold enough and we need to be here for our clients and customers. Contact us for the best customer service and full featured design, development, security, hosting, and I.T. company that you can actually hear smiling when on the phone or feel when you read an email.